When envisioning the perfect home for their family, our clients identified accessibility as paramount. 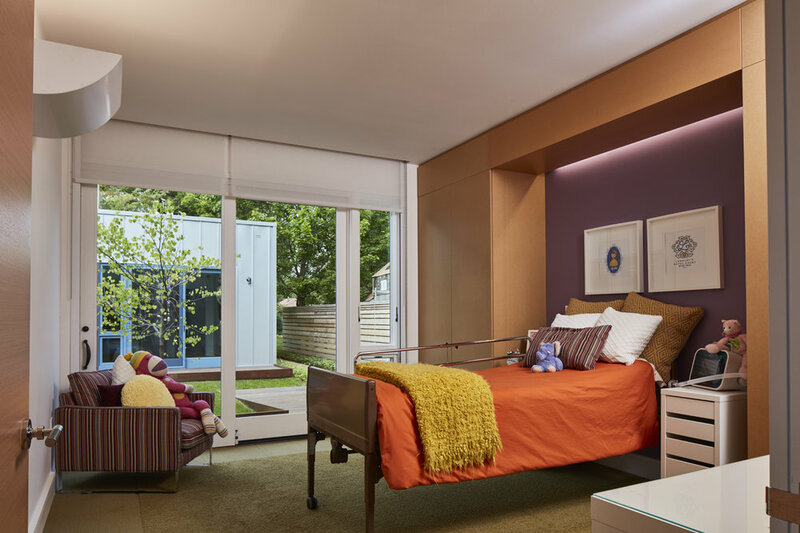 They needed seamless indoor/outdoor transitions and access for their two daughters who have special needs and rely on their wheelchairs to get around. After acquiring a long, skinny lot in Downers Grove, IL and hiring an architect, they turned to our firm to create a stimulating and flexible landscape that would invigorate and enrich the girls lives from childhood through maturity. View of the main courtyard from the central corridor in the house. This view can be seen from almost every room. This single family home is designed around a central spine with a series of courtyards granting access to the outside from every room. There are no steps anywhere on the site or on thresholds between indoor and outdoor. The landscape was designed to be completely accessible by a wheelchair. The courtyards offer the girls a variety of amenities and sensory experiences, including a low wall to sit on at the front entrance to wait for their brothers’ bus after school. In the main courtyard, a fountain with shallow basins is an invitation for soaking hands and feet. The mix of evergreen Hemlocks, Boxwoods and Pachysandra provide a year-round green garden. The home’s large windows and organization around courtyards mean the gardens are a central feature of the home all year. In the back courtyard, a fireplace provides a heating element for the family to enjoy the space even on cold nights. In time, the outdoor dining area will be shaded by the four Honeylocust trees. The plants we selected include abundant evergreens so the courtyards hold as much appeal in the winter as in the summer. Bulbs planted throughout the courtyards provide a spectacular display of color in the spring. Due to their medical condition, the girls spend a lot time on the ground, so the design provides for large areas of turf and shade. In the girls’ courtyard, ipe ramps and decks at every door assure a smooth, dry transition from inside to outside. The lawn provides a comfortable space for the girls to relax and lie down. 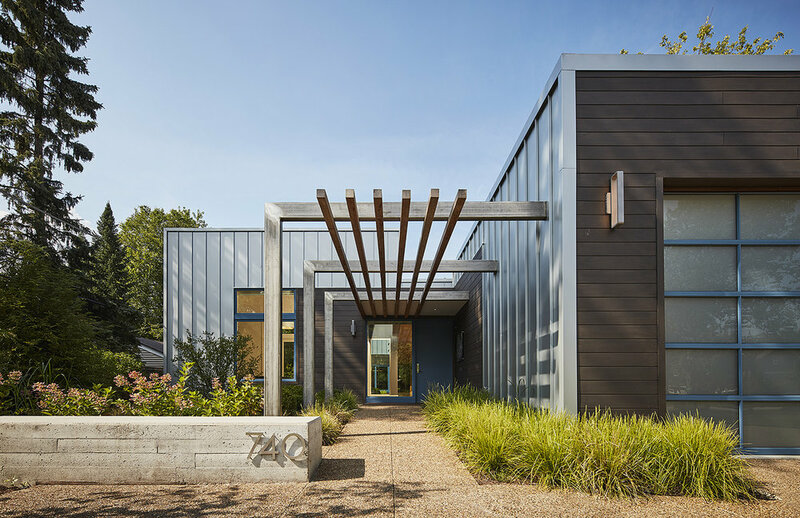 We incorporated two large rain gardens in the front and back yards to capture water throughout the site. The rain garden plants can survive both inundation and drought. 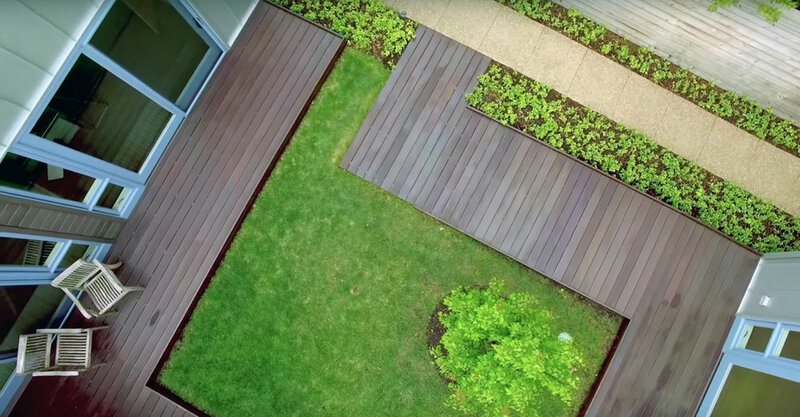 The project was awarded an ASLA Illinois Chapter Merit Award in 2017. The home was also featured in a video and article by Dwell magazine in 2017. Photographs are by Tom Harris Photography. We’re pleased to have collaborated with these firms on this project.